Have you struggled to squish your baby's cloth diapered bum into regular jeans? 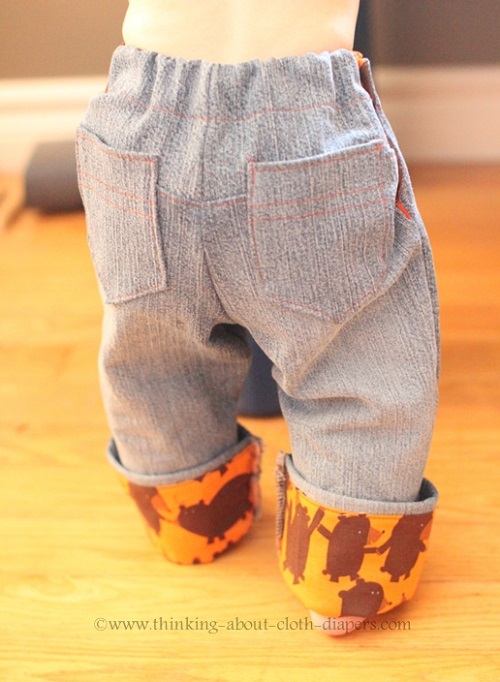 The Beanstock Britches sewing pattern is designed to help you make jeans for your baby's fluffy bum. From the Etsy listing: "This is the only pants pattern you'll need for your cloth diapered kiddo! It features a generous booty to keep even the largest cloth diapers contained, four snaps on either side of the waist so each size has a 7" waist range and a contrast cuff so the bottom can be rolled up but the pants are even cuter! When unsnapped, the pants open up wide to make them easy to slip over large cloth diapers. The waist is all one piece so there isn't any hassle with tucking parts in. In the e-book, you'll find instructions for making them into shorts as well as pants." Sewing clothes for your baby can be a lot of work. I've always loved designs that incorporate smart features that allow them to fit longer, so your baby can continue to wear the items you've made (with love) for a longer period of time. The Beanstalk Britches pattern is one of these patterns. With a cute roll-up cuff design to allow the jeans to grow with your baby, this pattern also incorporates an adjustable waist band that provides for easier access to change cloth diapers. Do you use disposable diapers part-time? 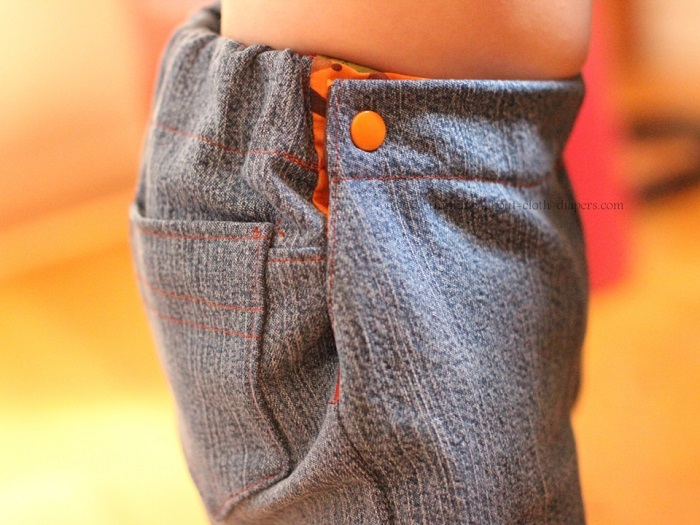 While the pattern has been designed to fit over cloth diapers, the adjustable waist band will allow these jeans to fit a much wider range of waist measurements than regular jeans. You can also make the "skinny" style. Or use the pattern for one size smaller, and add a few inches to the leg length. The author goes into more details on this in the pattern! A word on licensing: Some sewing patterns are quite restrictive about re-selling items you've made using the pattern. 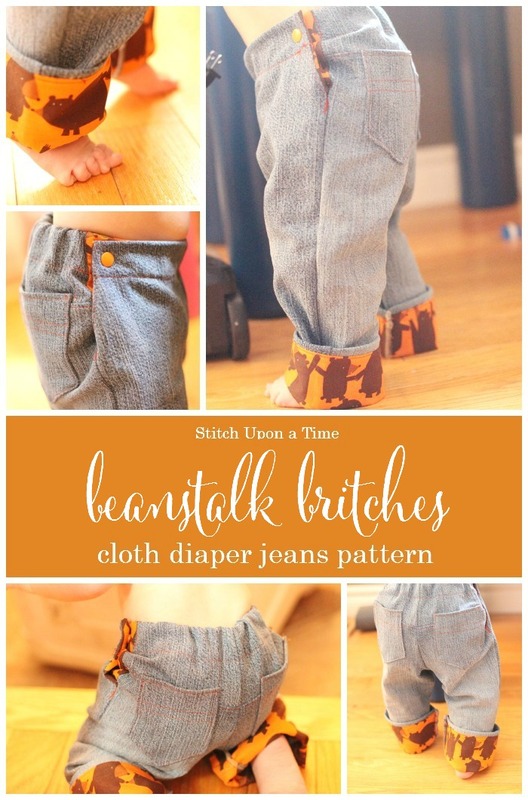 Stitch Upon a Time is very generous with the Beanstalk Britches pattern - they simply say if you bought the pattern, you can sell any pants you make with it! Customer Support: Stitch Upon a Time also has a Facebook group where you can get help with your projects and ask questions about your patterns. You can request to join here. Although I would consider myself an intermediate sewist, I haven't downloaded a lot of digital patterns beyond diapers and other smaller items. I really didn't know what to expect when I downloaded a PDF pattern for a larger item like pants, and I was actually very pleasantly surprised with this pattern! Each size and style of pants had its' own set of pages, making it easy to print off just what you needed and easy to cut out the right size. (My color printer wasn't working, and I was worried that there would be a lot of confusion if the various patterns were color-coded outlines on the same page - so not the case!) The instructions for taping the pages together were also very straight-forward. In terms of time commitment, I found that the first pair of jeans took me about 2 hours, but I could see any pairs I do going forward taking much less time. I found that putting the pattern together and getting the pieces cut-out was the most time-consuming part of the project - for me, this probably took about an hour. This pattern requires a snap-press or snap pliers and KAM snaps. If you have sewn any cloth diapers, you probably have them already. If you don't, you can purchase both snap pliers and snaps on Amazon.com I recommend getting a set that comes with an awl, as this makes pressing the snap through denim much easier. To start out with, I would recommend a light-weight denim or twill for these pants. I am sure you could use other fabrics once you get familiar with the pattern, but heavier fabrics will be stiff for your baby, and they can be harder to work with. I had a hard time finding denim fabric online in Canada, and with exchange and shipping, it didn't make sense to order anything from the States for a single pair. In the end, I made these jeans with fabric from a pair of jeans I ripped the knee out of. This worked well, but if you want to upcycle thrifted jeans, I would suggest that you avoid cutting from overly faded areas, as they can look a bit funny when assembled. In case you are wondering, the adorable bear cuff print is a quilters cotton from Free Spirit Fabrics. It's called Get Together Bears in a Line in Orange. Add double stitched seams around the pockets and back detail to make these look more like "real jeans"
Use heavier duty "denim" thread for top-stitching details - I found that the regular polyester thread I used on this pair shows up a bit when you get right up close (and actually stands out better in the photos than it does in real life). The accents are what makes this project really cute, and I'd like them to stand out a bit more! Try out the skinny cut - My son is fairly tall and average build but I find that even at 11 months, the Medium Regular Cut (6-24 months) are still folded up completely and are quite loose in the back end, even over some of our bulkiest diapers. Make them assembly-line style, cutting out the pieces for a few pairs at once, and then assembling them step-by-step. Join the online Facebook group - I did find the instructions about the waist-band a little confusing, and I'm sure that someone could have answered my questions faster than it took me to figure it out on my own! I found it was fun and rewarding to sew clothes for my little boy. 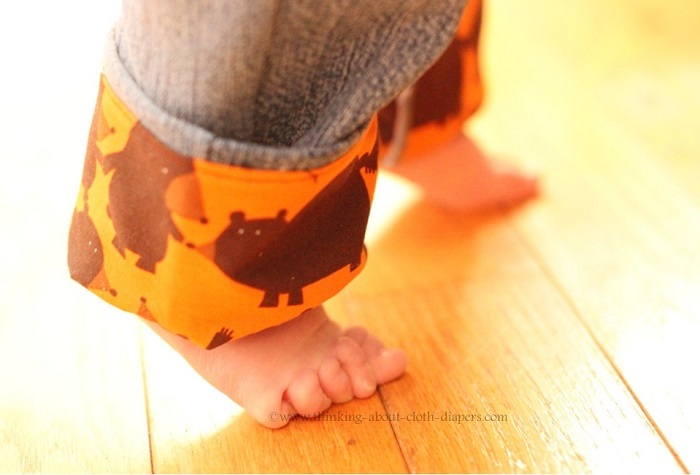 This pattern is well-done, and as promised, these jeans easily fit over our bulkiest cloth diapers. The photo below (as well as the others on this page) shows my son in a Best Bottoms all-in-two diaper with a microfiber insert. This isn't our bulkiest diaper, but it is about average, and as you can see, there's lots of room under the jeans. This pattern is available as a digital download from Stitch Upon a Time's Etsy Shop. It sells for $9.50 USD, and is available for download immediately after you pay for it. Want to win a copy of your very own? Stitch Upon a Time is offering an electronic copy of the Beanstalk Britches pattern ($9.50 ARV) to one lucky reader! Disclosure: I did not receive any form of compensation in exchange for this review, but the publisher did provide me with a complimentary copy of the sewing pattern for the purpose of this review. The opinions expressed in this post are entirely my own, and your experience with the product may differ from mine. I only recommend products or services I use personally and believe will be good for my readers. This article may contain affiliate links. I am disclosing this in accordance with the Federal Trade Commission’s 16 CFR, Part 255: “Guides Concerning the Use of Endorsements and Testimonials in Advertising.” For more information, see our Disclaimer and Copyright. Go back to Making Cloth Diapers for information about making your own cloth diapers, including fabric and diaper pattern suggestions.